The Metasys system can be operated from a desktop or a laptop computer, or any remote browser-supported device. The President and Chief Engineer of Tower Management, Neil Willer, is very satisfied with the system. "However," Willer said, "I was faced with a dilemma a year or so ago. The Metasys system only supported a specific ARCNET card that ran under Windows® 98 or older. Eventually, the card was not supported or would even fit into newer PCs and of course, Windows 98 fell by the wayside." Johnson Controls assessed the situation and contacted Contemporary Controls® in Downers Grove, Illinois, a leading ARCNET manufacturer. Johnson Controls furnished and installed Contemporary Controls' Metasys ARCNET/Ethernet Router. "The router interfaced seamlessly into the ARCNET infrastructure," said Willer. "We were able to keep the older ARCNET devices and replace the front-end PC with Windows XP; otherwise it would have meant retrofitting to Ethernet at a substantial cost." Willer explained that without this product, all the 11 field devices would have to be replaced at a cost of $4000 each. Also, the coaxial backbone would have to be re-wired using twisted-pair which would require much labor. The ARCNET/Ethernet router is a double-wide expansion module that fits into the MOD Hub series of ARCNET Modular Active Hubs. Once installed in a MOD Hub chassis, an ARCNET connection is made through the chassis backplane. On the front panel of the router is an RJ-45 connector which provides the 10BASE-T Ethernet connection. Resident in the router is an embedded computer with a solid-state flash disk capable of executing an application program. This application program routes packets between ARCNET and Ethernet networks. 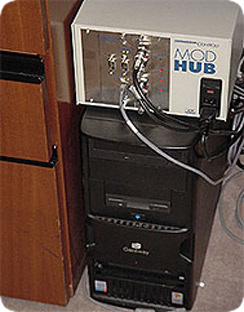 To configure the router, a laptop computer running a terminal emulation program, like HyperTerminal, is attached to one of the CoM ports using a null-modem cable. Once configured, the program runs continually. The one router sits on the floor behind the PC tower. The front-end PC contains the Metasys software, connected to the field devices via RG-59/u coaxial cabling. From each field device to the PC total length is near 1500 feet. Overall, coaxial cable offers good performance, good noise immunity, low signal attenuation, sufficient ruggedness, and low cost. The field devices are then connected to the facility systems such as HVAC and security. They can operate as stand-alone and are even accessible by a small hand-held device similar to a laptop. These field devices are on the ARCNET-as is the front end, where the daily operation and changes are performed and where trends and history are stored. Willer said the router works quite well. "With everything up and connected and talking, alarms come in as they occur."